"Every vessel shall at all times maintain a proper look-out by sight and hearing as well as by all available means appropriate in the prevailing circumstances and conditions so as to make a full appraisal of the situation and of the risk of collision." No sensible skipper would argue against that, but I do know of a few cruising sailors who make no attempt to comply with the rule, just turning in at sundown and relying on the statistical improbability of being run down. Our sailboats are minuscule in comparison to some of the behemoths that roam our oceans - they wouldn't even feel the bump. In this system the night watch is split into three 4 hour periods, which means that one person does two night watches one day and a single night watch the following day. Each crew member has a 6 hour off-watch period during the day. We all know how to deal with a riding turn on a cockpit winch - it's in every sailing textbook. You just take a separate length of line, attach it with a rolling hitch to the jammed sheet a few feet ahead of the winch and take the tail of it to another winch further aft or on the opposite side of the cockpit. This takes the load off the jammed winch and allows the riding turn to be sorted out. A few weeks ago Mary and I were crewing for a pal and his wife on their UFO 31 in a local regatta. Having successfully rounded the leeward mark we were sheeting the genoa in hard. We got a riding turn. No great problem, we thought as we applied the remedy outlined above. What the text books don't tell you is what to do when you get another riding turn on the second winch, the next mark is fast approaching, someone is screaming STARBOARD! at you and you've run out of available winches. We spotted this junk-rigged sailboat at 'Dandy Hole', a glorious sheltered anchorage on a bend in Cornwall's River Lynher River. At first I thought it might be a Freedom 40 but soon decided it wasn't. Intrigued, I googled the name Ti-Gitu and got her identified immediately. 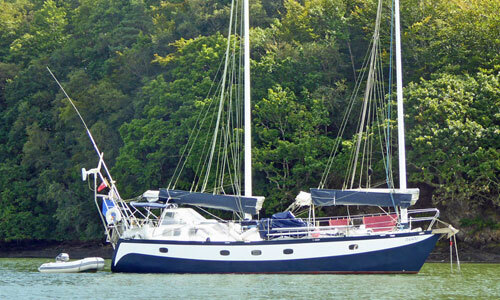 She's a one-off multi-chine steel boat designed and built by Paul Fay for long-distance cruising. Paul has a number of other 32ft to 44ft steel-hulled designs to his credit, all steel hulls for long-distance cruising and you can see them - along with a lot of other interesting stuff - on his website at Fay Marine. "We are not a full service, high end marina - but we are are a friendly place run by sailors for sailors, where you can melt yourself under layers of epoxy and polyurethane paint if you so wish." 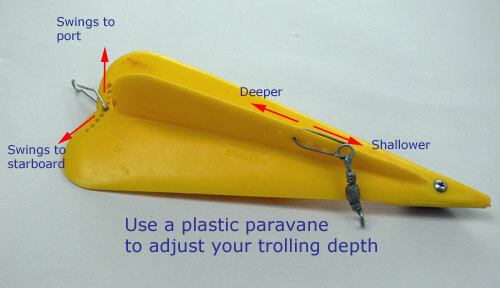 A paravane is a plastic device that works like an inverted wing, diving deeper as boat speed increases and dragging your lure down to a greater depth than it would otherwise achieve. They're attached between the main line and the leader, where your trolling sinker would otherwise be. On some models, like the one shown here, there's a choice of attachment positions, the furthest aft producing the steepest diving angle and vice versa. Similarly, there's a choice of attachment points on the trailing edge, which can be used to pull the lure off to port or starboard - very useful to get some separation when trolling two lines. The leader (to which the lure is attached) should be about 20 feet long to prevent the turbulence created by the paravane from spooking the fish. Most paravane designs are ballasted by a moulded lead weight attached to the forward end. You can see the attachment screw in this pic. Paravanes capsize when a fish strikes the lure, converting the ‘dive’ effect to ‘climb’, which brings the fish to the surface where you’'ll see it splashing about astern. They're at their best when trolling small lures at moderate speeds. The smaller 50g versions are best for trolling light lures at around 2knots or so, while the larger 150g versions work well at up to 5knots or so and will get your lure down deeper. Quite a few visitors to sailboat-cruising.com have said they's like to submit an article for publication on the website. I'm fully in favour of that and have now made it really easy for anyone so inclined to do so. Here's how to submit your Sailing Stories & Articles... So to quote the late, great Eddy Cochran, "C'mon Everybody" - get writing! It's always worth taking a look at what our visitors are getting rid of. Remember one mans junk is another man's gold! a Monitor Windvane Self-Steering Gear.